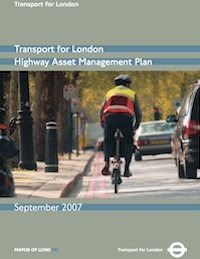 The Transport for London – Highway Asset Management Plan is available here. This document includes the following sections: Asset Valuation, Introduction, Investment Strategies, Levels of Service, Objectives and Measures, Performance Assessment. The Transport for London Highway Asset Management Plan is structured to first, connect strategic context with everyday work, and second, to outline the capital renewal and operational management of various highway asset types. A section on level of service connects day-to-day work to agency strategies through performance monitoring and includes steps to achieving long-term goals. For each of the asset types covered in the TAMP, the document provides a summary describing the importance of maintaining the asset in a state of good repair, as well as potential improvements. The assets covered in the document include carriageways and footways, highway structures, tunnels, lighting, and other assets sign as signs, drainage, and furniture.